Don’t forget to drop by the Ursa Major Awards and nominate Follower for Best Graphic Story or Best Other Literary Work! Even a simple nomination is a huge honor, and would help us make the comic known! Panel 1: The hologram takes of running, carrying its weapons. Panel 2: As the real Vloxen watches, the hologram darts off into the room: a large gymnasium with a series of combat dummies and transparent barriers in a scattered arrangement. 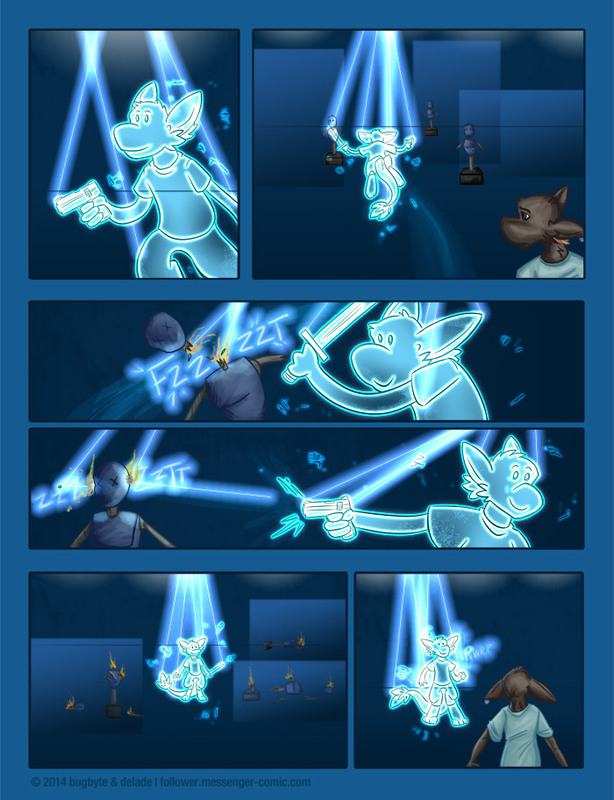 Panel 3: The hologram uses the sword and swipes off the head of one of the combat dummies. Lasers cut through it, doing actual damage and igniting the fabric. Panel 4: The hologram raises its pistol and a laser blast cuts through another dummy’s head, setting it on fire. Panel 5: A wide shot of the gymnasium, showing the hologram standing among a pile of burning wreckage, smiling pleasantly. Panel 6: The hologram’s weapons vanish, and the Vloxen looks on, ears back in terror.